I was just checking Shorpy over the weekend, when I was struck with this image of robots coolly firing at the Army troops desperately holding them off. As I remember, this happened around 1940, but was suppressed because rising tensions with the Japanese took priority. The robots were eventually domesticated, and used for construction purposes. I love the angle of the photo, by Russell Lee, for the Farm Security Administration. What they actually are is almost as interesting. Shasta Dam was concrete. A large central tower was built next to the concrete plant. It was connected by cables to a total of seven towers like the two above, which actually moved on tracks, as you can see in the image below. 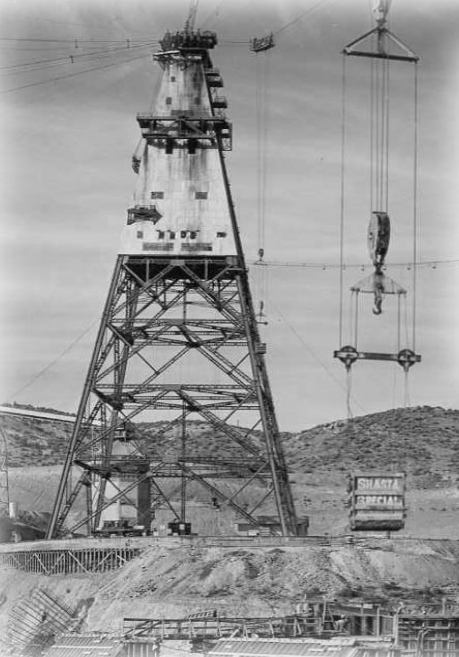 Large buckets were filled with concrete at the plant, then cranked across to one of the towers, where it was dumped to form blocks fifty feet square and five feet deep, which make up the dam. I don’t know how often this particular method was used to build dams, but it has a real dieselpunk charm. Lee’s photograph of the dam under construction is itself a wonderful image, worth clicking through to Shorpy to see in full.